Authorities in Saudi Arabia say the construction company overseeing an expansion project at the largest mosque in the world was partially responsible for last Friday’s crane collapse that killed at least 107 people and injured nearly 400 in Mecca. According to various news reports, citing the official Saudi Press Agency, an initial investigation into the collapse has found that the construction giant Saudi Binladin Group had not “respected the norms of safety” and was “in part” responsible for the deadly collapse. Saudi Arabia has suspended construction company Saudi Binladin Group from new public contractors in the wake of a fatal crane collapse at Mecca's Grand Mosque. Reports say the crane was not erected in accordance with the manufacturer’s instructions. The group’s leaders have been banned from travel outside of the country until the investigation is complete, reports note. The long-time government contractor is also suspended from any new public contracts during that period, reports say. The company had not issued a comment on the investigation or suspension Thursday (Sept. 17). The crane, situated at the Grand Mosque, toppled over during a storm around 6:30 p.m. Sept. 11, days before millions gather in the holy city for the annual Muslim hajj pilgrimage. The Masjid al-Haram mosque is the largest in the world and surrounds the Kaaba. Following the incident, King Salman, the country’s monarch, vowed to find out what caused the construction crane to topple. He assembled an official committee for that purpose. 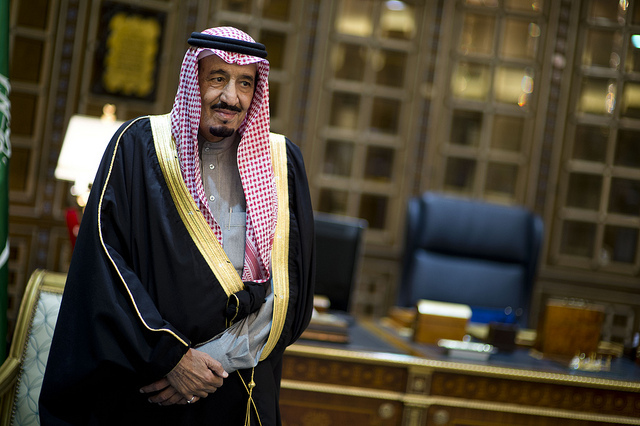 King Salman of Saudia Arabia, Custodian of the Two Holy Mosques, has vowed to find out the cause of the deadly collapse. In its first report released Tuesday (Sept.15), the committee suggested negligence on the part of the Saudi Binladin Group, but concluded that it found no criminal activity, according to Arab News. “[T]he main reason for the accident is the strong winds while the crane was in a wrong position,” the news outlet said, citing the report. Numerous photos and videos posted to social media sites showed the apparent aftermath of the collapse—blood-covered worshipers on a marble floor and debris that had fallen through the ceiling. At least one video circulating was said to have captured the red and white crane crashing down. Additional photos show what appears to be lightning striking the crane. The crane that collapsed was one of many being used on the expansion of the Grand Mosque, a project led by Saudi Binladin Group, headquartered in Jeddah. Construction crews have been working for four years to enlarge the structure by 400,000 square meters (4.3 million square feet) in order to accommodate 2.2 million people at once, reports say. Founded over 80 years ago, the company is run by the family of the late al-Qaeda leader Osama Bin Laden. The Binladin Group on Sept 11th how ironic!! !